This book invites newcomers into a deeper engagement with Scripture. One of the often overlooked gifts of the Anglican Church is that the texts and doctrines of the Bible are embedded in our prayers, liturgies, and creeds. Thus Anglicans tend to know the Bible better than they realize; they just don't know chapter and verse. Making that knowledge explicit and placing it in context can help to overcome the "disconnect" many Anglicans feel with the Bible, and can open the way for further and more in-depth study. - Publisher New Episcopalians may be nervous about opening the Bible; others simply don't know how to begin. An often-overlooked gift of the Episcopal Church is that the texts and doctrines of the Bible are embedded in its prayers, liturgies, and creeds. Making that knowledge explicit and placing it in context can open the way for further and more in-depth study. 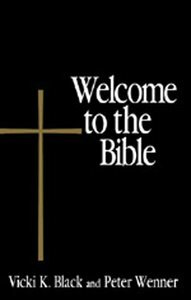 About "Welcome to the Bible"
Vicki K. Black is an Episcopal deacon who has served in the dioceses of Massachusetts, Milwaukee, and Washington, where she has worked in publishing, parishes, and in coordinating retreats. She resides in Bethesda, Maryland, with her family.